My full-frame DSLR just doesn’t get the use my little Fuji X-trans CSC does. Realistically, landscape astrophotography often involves hiking and I can rarely be bothered hiking with my EOS5D. Last year, when I went to the US for the Grand Canyon Star Party, the Fuji was the only camera I could squeeze into my 30+ Kg of astro-luggage (of which just 1 Kg was personal items). So, for landscape astrophotography I have switched from full-frame to the Fuji, which has a very low noise sensor anyway and is much more convenient for travel, especially if I am loaded up with other gear. On paper, Fuji make some ideal fast primes for astrophotography too, especially the F1.4 XFs - 16mm and 23mm. 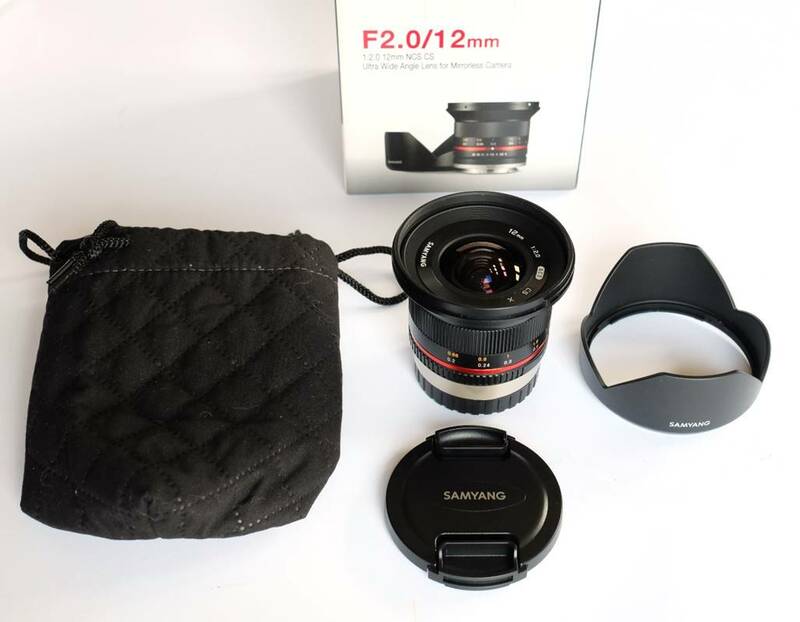 Unfortunately, the Fuji XF 23mm lens proved to have too much coma at the edges, so instead of the 16mm I bought the lens I am testing here – the much cheaper and smaller Samyang 12mm F2, a lens available for various other cameras as well. Samyang have developed a reputation for landscape astro’ lenses, especially with their 24mm F1.4. The 12mm is quite a lot slower, but given its short focal length that shouldn’t matter – just give it a longer exposure and it will still be free of star trails. Note: All the example images below are straight from the camera. Apart from cropping and re-sizing, I have done no post-processing of any kind. Samyang include end caps a lens shade and a lens bag. Like other Samyang lenses, build quality is excellent. It doesn’t have the premium look and feel of a Fuji XF or a Zeiss or Leica lens, but the plastic is solid and built on a metal chassis. The front elements are very steeply curved and look well coated; they are quite small on this lens, which may explain why it’s much cheaper than say the 24mm F1.4. The controls are all-manual and work well. The aperture ring has a nice feel with positive click stops and an intermediate setting between each main stop. The focus is mostly smooth and accurate, but makes a ‘squelching’ noise sometimes and is occasionally slightly ‘grittier’ than the best. Fully manual controls don’t bother me – I almost always focus landscapes on manual anyhow and I like the fact that there is less to go wrong. The Samyang 12mm F2 is significantly smaller and lighter than Fuji’s own fast, wide-angle primes – a bonus when travelling light (or trying to). As usual, I will be focusing this review on astrophotography, but a brief comment on daytime performance is in order. In the daytime, the Samyang 12mm F2 produces reasonably sharp and very wide images. Centre field quality is good. Image quality drops off a bit in the corners and chromatic aberration on high contrast subjects increases, but it’s good for a lens as short as 12mm. 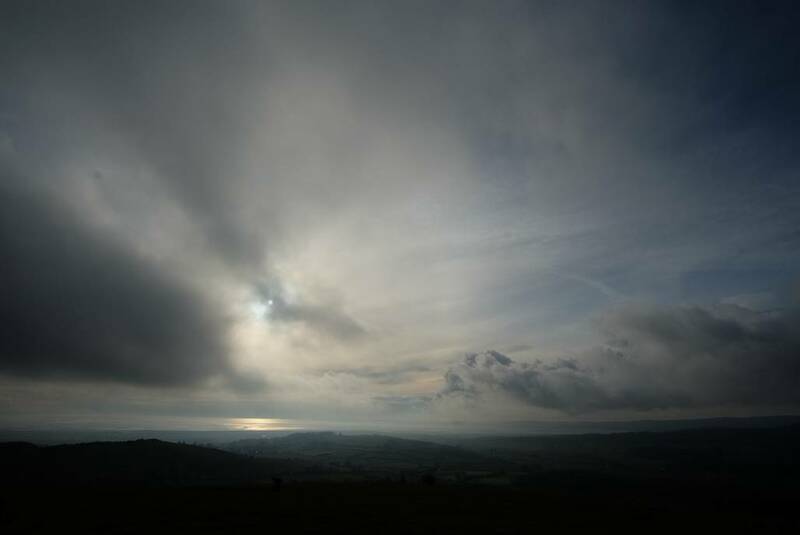 There is more corner darkening (caused by vignetting) than with the best Fuji XF lenses, but less than many (most?) full-frame primes. There is some distortion, but that’s to be expected with such a wide angle (98.9°). Overall, the Samyang 12mm excels at landscape and architecture shots, with that wide angle really adding drama to your compositions. The maximum aperture of F2 is completely usable and allows some control over depth of field, even on such a short focal length. The wide field adds drama to sky-scapes, day or night. The maximum aperture of F2.0 is a bit slower than I would like for astrophotography, but it’s not the issue you might think. Why? Because the shorter the focal length, the longer you can leave the shutter open without producing star trails (trails are always there, of course, it’s just that they are shorter than the resolution of the sensor). In this case, trails only start beyond 15s and are still manageable at 20s, compared with about 8-13s for my 23mm lens. 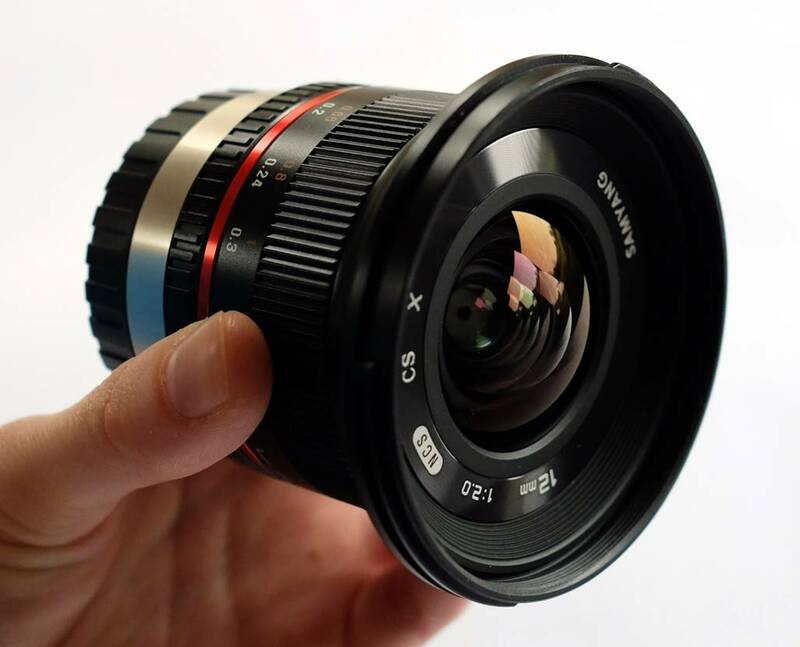 Overall, that means you can probably get a similar exposure to the Samyang 24mm F1.4 at a given ISO. With a fairly clean ISO setting of 2500-3200 it’s enough to capture plenty of Milky Way, lots of fainter stars and some nebulosity too. 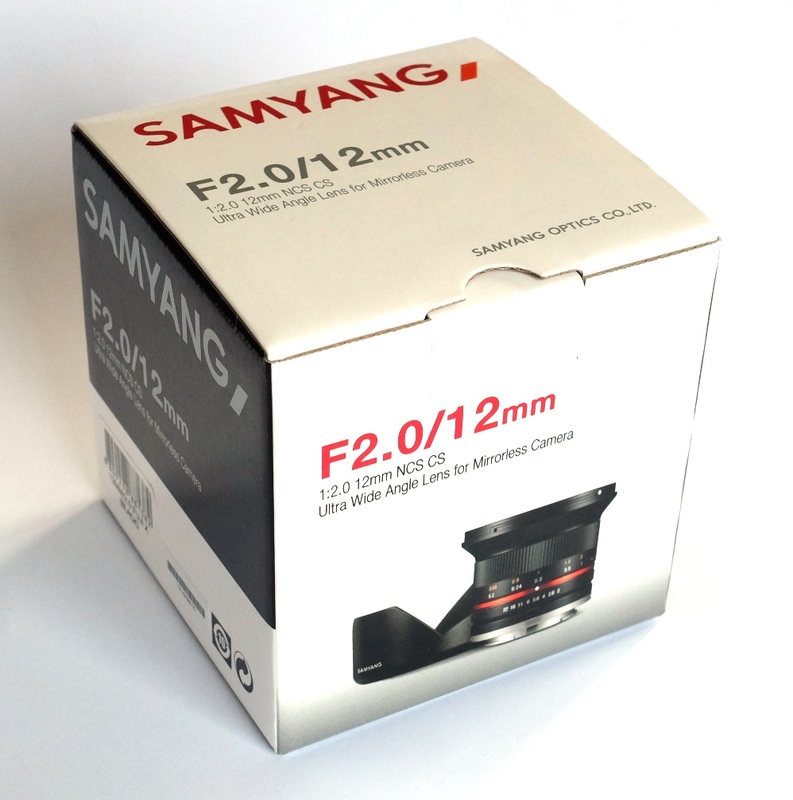 So far, that makes the little Samyang similar in astro’ performance to Fuji’s own Japanese-made fast XF primes. But where the Korean lens really wins is in edge performance. The XF primes tend to be well corrected across much of the frame and then suffer from a lot of coma and astigmatism at the corners - bloating stars tangentially and giving a strange circular look to the outer parts of the image which I don’t like. In comparison, the Samyang 12mm has much less coma and the remaining astigmatism is progressive and largely radial (star elongate away from the centre), mainly noticeable in the corners. 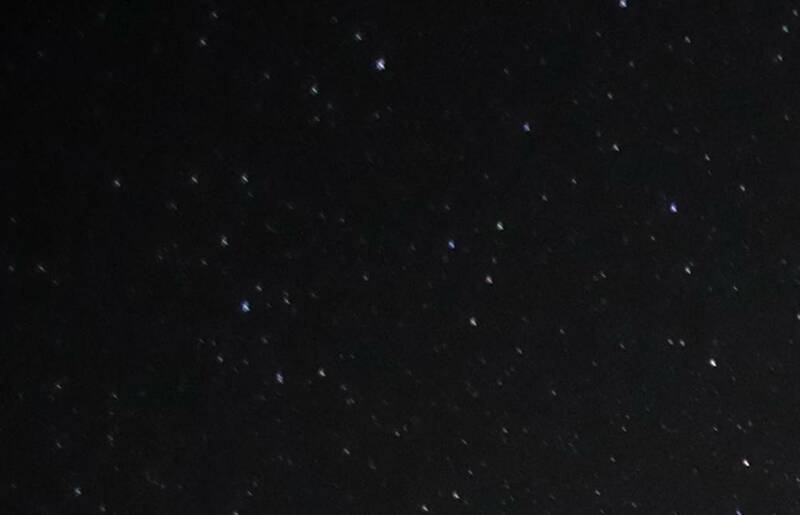 So, with a bit of judicious cropping, you could get shots as wide as Fuji’s XF 16mm, but with sharp stars edge-to-edge. The Samyang 12mm still isn’t perfect, though. There is some corner darkening, caused by vignetting, unlike a Fuji XF prime. Chromatic aberration (false colour) is better than the Fuji centre field, but still quite noticeable, especially at the edges where stars show violet blur. Overall, landscape astrophotography performance is as good or better than Fuji’s own, much more expensive, fast primes; the Samyang 12mm F2 is usefully smaller and lighter too. 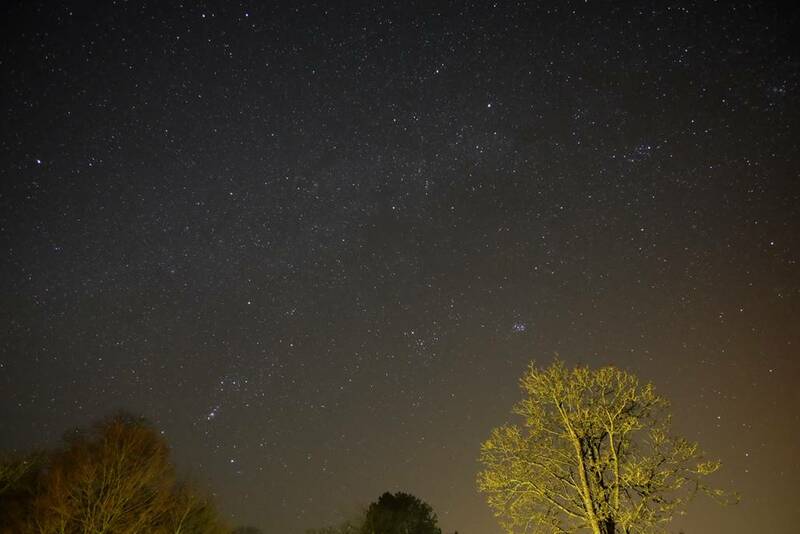 Samyang 12mm lens at F2: 18s at ISO 3200: Milky Way, Orion and Taurus in my polluted skies. Edge performance is good but vignetting evident as darkened corners. 100% crop of top left corner shows some vignetting and astigmatism, but coma is well controlled. The Samyang 12mm F2 is a bit of a find for landscape astrophotography. It’s fast enough to capture the Milky Way, wide enough to create dramatic images and allow longer exposures without star trails. Most importantly, though, it is pretty sharp at the edges, with much less off-axis coma and astigmatism than the depressing norm from the big players. This means nice tight stars to the edge (if not the very corners), which really improves sky-scapes and avoids having to crop out the drama from that special shot. The icing on the cake is its relatively low price compared to the competition and its very compact size. The only downsides are the occasional squelch from the focuser, a bit more corner darkening (vignetting) than you get with Fuji’s own XF lenses and the slower-than-ideal maximum aperture of F2. Mated to one of Fuji’s smaller X-Trans bodies, the Samyang 12mm F2 makes for a landscape astro’ rig that will go on a tiny tripod and is much easier to travel and hike with than a big DSLR and lens combo. 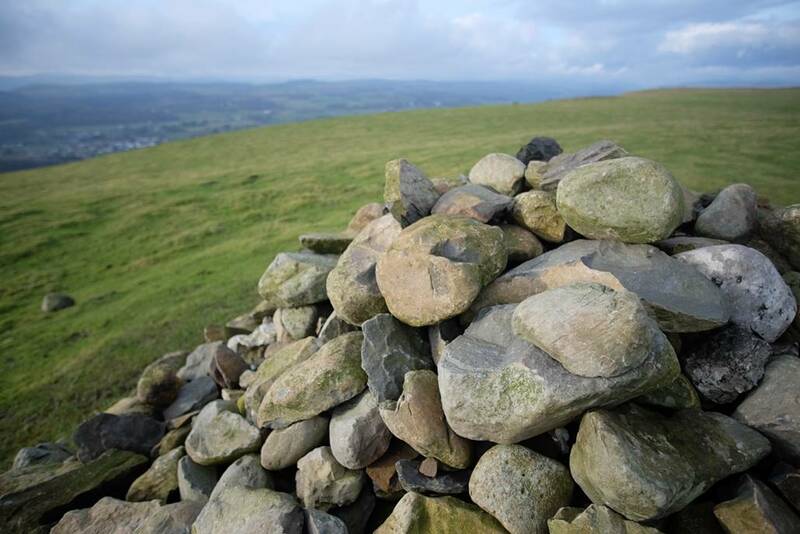 I fully intend taking mine to some interesting places – check this article for updates. When I get some images from a proper dark sky site I will post them here. Not as fast as would like, it is still an excellent lens for landscape astrophotography - super small and light for travel to and around those dark sky locations. It’s cheap as well. An easy ScopeViews Best Buy.